The 360° swivel base makes it comfortable for both right- and left-handed use and non-slip feet make the KBOV3001BG practical and easy to use. Water level indicator located on the back of the kettle. Item has been cleaned and is in good working condition, collection only. Removable, washable scale filter and non-slip feet. Colour Beige. This is subject to the size of the product ( getting past obstructions / through doorways ) and also in weight. Rapid Boil Yes. OPENING HOURS WE HAVE A SHOWROOM OPEN TO THE PUBLIC ! 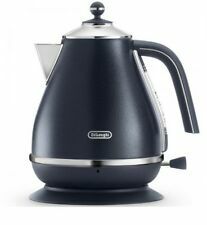 Delonghi black icona micalite cordless kettle KBOM3001,BK. Condition is New. Dispatched with Royal Mail 2nd Class. This is from a smoke and pet free home. This kettle has a 360 degree swivel base which makes it ok for right or left hand use. It's in full working order and only has minor marks, but does require descaling inside (which all kettles get). Add a touch of elegance to your kitchen with the sleek and desirable De'Longhi Micalite KBOM3001 Jug Kettle.Beautiful design Boil quickly and efficiently with this beautiful 50s-inspired matt black electric kettle that will look the part in any kitchen. Azure blue finish kettle with soft touch leather and aged wood colour detail. Removable, washable scale filter and non-slip feet. 1 x 1.7 L Kettle. Andis Lithium Titanium Foil Cordless Shaver. Water Bottles & Filters. Exclusion apply. Water level indicator. 3-level safety protection: Auto shut-off when water begins to boil, Thermal Cut-off, Auto shut-off when body is lifted from base. Hot drinks in an instant. Call Us: 01484 950489. A Collections and Drop off locations Designed to make your life easier. Any personal data upon the unit, removable or not. Seals upon software have been broken The device has non-standardized pin (unlock) code Manufacturer content (Software) has been removed/deleted The issues with the device are not covered by the manufacturers warranty. KBOV3001BG. Water level indicator located on the back of the kettle. Input power (W) : 3000. Weight (Kg) : 1.3. - Non-slip feet. - Cord storage. 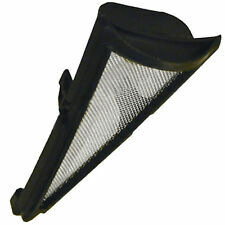 - Removable, washable anti-scale filter. Auto shut-off when body is lifted from base. DeLonghi KBOE3001.R. Rapid boil 3kW cordless kettle. Stylish Red finish. 3 level safety protection Non-slip feet. Cord storage. DeLonghi KBOE3001.BL. Rapid boil 3kW cordless kettle. Stylish Blue finish. 3 level safety protection Non-slip feet. Cord storage. Rapid boil 3kW cordless kettle - Features a 360?. swivel base, Water level indicator - Detachable base for cord-free convenience - 3 level safety protection - Thermal cut-off & Auto shut-off, Non-slip feet. 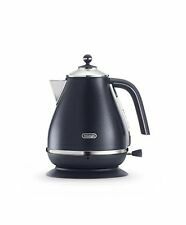 The Black Icona KBO2001BK is a fabulous Italian 1950s style Kettle with 1.7 litre capacity and a painted stainless steel body. It includes a 360° swivel/detachable base for cord-free convenience and water-level indicator conveniently located on the back of the kettle. Additionally, an anti scale filter and a unique high gloss finish make this kettle exceptional. *Our electrical appliances are fitted with Australian electrical plugs designed to be operated on 220-240V, 50Hz power supply. You may use this product overseas by using an adaptor and may need a step down transformer. .
Capri, Portofino and other beautiful Italian coastlines with their evocative marine shades, are the inspiration for this edition, which brings the fresh coastal taste of distant places to your kitchen. *Our electrical appliances are fitted with Australian electrical plugs designed to be operated on 220-240V, 50Hz power supply. You may use this product overseas by using an adaptor and may need a step down transformer. .
Cord length: about 1.3 m.
Manufacturer: DeLonghi (delonghi). Color: Dolce beige. Part number: KBOV1200J-BG. Batteries included: no. Batteries used: no. GR-olive green. KETTLE RETRO DESIGN. Cordless stainless steel boiler. Color: Olive green. We will compare serial no. Countries as:Israel! The White Icona KBO2001W is a fabulous Italian 1950s style Kettle with 1.7 litre capacity and a painted stainless steel body. It includes a 360° swivel/detachable base for cord-free convenience and water-level indicator conveniently located on the back of the kettle. Additionally, an anti scale filter and a unique high gloss finish make this kettle exceptional. *Our electrical appliances are fitted with Australian electrical plugs designed to be operated on 220-240V, 50Hz power supply. You may use this product overseas by using an adaptor and may need a step down transformer. . The water level indicator is located on the back of the kettle and allows you to manage the correct amount of water. Water level indicator located on the back of the kettle. 3-Level safety protection includes auto shut-off when water begins to boil, thermal cut-off and auto shut-off when the body is lifted from the base. The White Icona KBO2001W is a fabulous Italian 1950s style Kettle with 1.7 litre capacity and a painted stainless steel body. It includes a 360° swivel/detachable base for cord-free convenience and water-level indicator conveniently located on the back of the kettle. Delonghi Icona Kettle 2-Slice Toaster Breakfast Bundle. 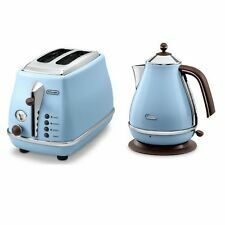 The DeLonghi Icona Collection is a suite of stylish kitchen essentials that evokes the essence of 1950's la dolce vita. Colour: White. Popular Model . We will provide best service! Masa Japan. Why Choose Us ?. Headphone & Earphone. CASIO G-SHOCK. Body weight (kg): 0.85. Cord Length: about 1.3m. Warranty: 1 year. Delonghi Icona Kettle 2-Slice Toaster Breakfast Set Colour: White Brand New, Free Shipping The DeLonghi Icona Collection is a suite of stylish kitchen essentials that evokes the essence of 1950's la dolce vita. The collection adds a touch of class, creativity and elegance to any kitchen. Key Features Toaster ---Power 900W ---2-slice toaster ---Removable crumb trays ---All functions with neon indicator ---Extra lift position ---Progressive, electronic browning control ---Removable crumb tray ---Unique high gloss onyx finish with chromed detail Kettle ---Capacity 1.7L ---Water level indicator ---360° swivel base ---Auto shut-off ---Thermal Cut-off ---Removable, washable anti-scale filter ---Flat stainless steel concealed element ________________________________ Items will be sent as soon as payment cleared. With automatic stop, boil dry protection and overheat protection. Water level indicator: si. Account with a 360 swivel base and detachable for use more comfortable, cordless. Wide opening lid: si. Product color: verde. Delonghi Icona Kettle 4-Slice Toaster Breakfast Bundle. The DeLonghi Icona Collection is a suite of stylish kitchen essentials that evokes the essence of 1950's la dolce vita. Colour: White. Popular Model . Delonghi Icona 1.7L 2000W Jug Kettle - Designer Colour: Silver Brand New, Free Shipping *** Popular Model *** The DeLonghi Icona Collection is a suite of stylish kitchen essentials that evokes the essence of 1950's la dolce vita. The collection adds a touch of class, creativity and elegance to any kitchen. Key Features ---Capacity 1.7 Litres ---Water level indicator ---360° swivel base ---Auto shut-off ---Thermal Cut-off ---Removable, washable anti-scale filter ---Flat stainless steel concealed element ________________________________ Items will be sent as soon as payment cleared. See other listings for other styles and models. All products are designed for use in Australia. MPN KBOV 2001. -Three safety devices: shuts off automatically when the water is boiling; thermal protection; turns off automatically when separates the kettle from the base. Tipo Hervidor sin cable. Delonghi Icona 1.7L 2000W Jug Kettle - Designer Colour: Green Brand New - Free Shipping The DeLonghi Icona Collection is a suite of stylish kitchen essentials that evokes the essence of 1950's la dolce vita. The collection adds a touch of class, creativity and elegance to any kitchen. Key Features • Capacity 1.7 Litres • Water level indicator • 360° swivel base • Auto shut-off • Thermal Cut-off • Removable, washable anti-scale filter • Flat stainless steel concealed element ________________________________ Items will be sent as soon as payment cleared. See other listings for other styles and models. BL Kettle Blue. Discover the De'Longhi water cooker KBOE 2001. The water level indicator on the back of the water boiler indicates the filling quantity in the boiler. The cordless water boiler can be rotated 360 ° on the base station. Delonghi Icona Capitals 1.7L 2000W Jug Kettle - Designer Vintage Colour: Yellow Brand New, Free Shipping The DeLonghi Icona Capitals Collection is a suite of stylish kitchen essentials that evokes the essence of vintage 1950's la dolce vita. The collection adds a touch of class, creativity and elegance to any kitchen. Key Features ---1.7 Litres, 6 cup capacity ---Water level indicator ---360° swivel base ---Auto shut-off ---Thermal Cut-off ---Removable, washable anti-scale filter ---Flat stainless steel concealed element ---3 level safety protection: auto shut-off when water begins to boil; thermal cut-off; auto shut-off when body is lifted from its base ---Non-slip feet ---Cord storage ________________________________ Items will be sent as soon as payment cleared. See other listings for other styles and models. Delonghi Icona 1.7L 2000W Jug Kettle - Designer Colour: Red Brand New, Free Shipping *** Popular Model *** The DeLonghi Icona Collection is a suite of stylish kitchen essentials that evokes the essence of 1950's la dolce vita. The collection adds a touch of class, creativity and elegance to any kitchen. Key Features ---Capacity 1.7 Litres ---Water level indicator ---360° swivel base ---Auto shut-off ---Thermal Cut-off ---Removable, washable anti-scale filter ---Flat stainless steel concealed element ________________________________ Items will be sent as soon as payment cleared. See other listings for other styles and models. All products are designed for use in Australia.